Brittany and David’s wedding was a day filled with love, laughter and plenty of Penn Pride! As young college freshman at the University of Pennsylvania, Brittany and David were introduced to an education and a love they would share with one another for an eternity beyond those next four years. Since the city of Philadelphia is where these two college sweethearts first met, it was only fitting that Brittany and David came back from NYC to tie the knot at the city’s celebrated and historic Rittenhouse Hotel. Allure Films and Cliff Mautner Photography were at Brittany and David’s wedding to photograph and film beautiful moments between the couple and their wedding party inside the hotel, as well as outside against the picturesque backdrop of Rittenhouse Square Park. Both the ceremony and reception took place in the hotel’s ballroom, which was magically transformed while guests enjoyed cocktail hour. Philadelphia’s Evantine Design team were behind all of the spectacular floral arrangements, including the gorgeous hanging floral display that served as the couple’s chuppah. After the beautiful ceremony, everyone let loose on the dance floor and hammed it up for the photobooth station, which provided tons of fun props and buttons with sayings such as “PENN IS MY HAPPY PLACE.” When the guests were wiped out from taking photos and dancing, they were sure to stop by the bagel wall! David’s company, Schmear It, provided a wide variety of bagels and “Schmear” to satisfy the guests’ biggest cravings. Brittany and David, Mazel Tov and Go Quakers from all of us at Allure Films! Contact Allure Films for more information about our comprehensive wedding videography packages. Rebecca and Jared were all smiles, all day at their elegant spring wedding in Center City Philadelphia. 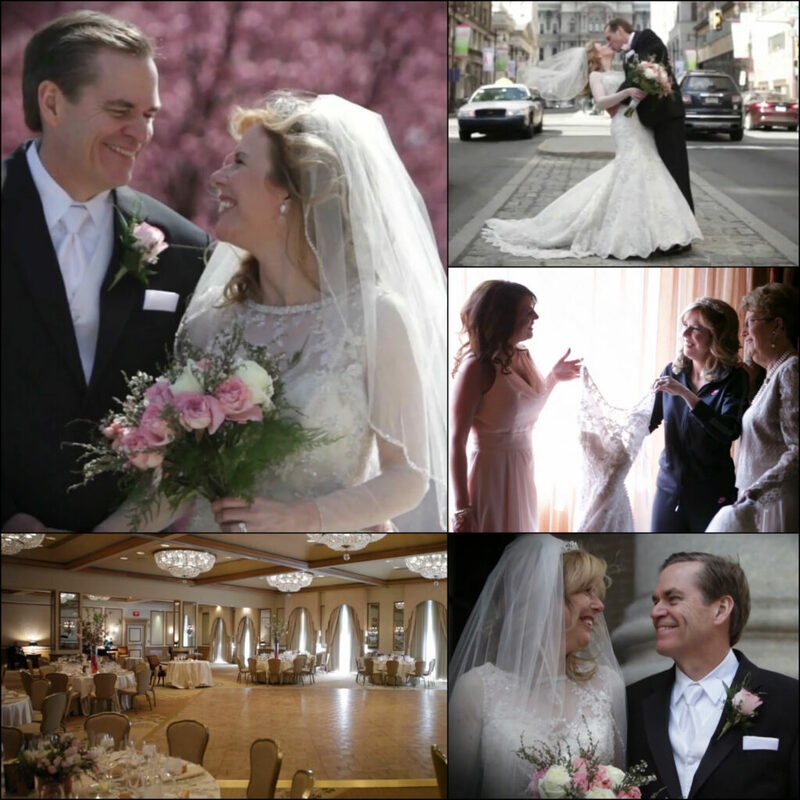 They chose the Rittenhouse Hotel, a stylish and flexible venue, for their special day. With several elegant spaces to choose from, the hotel can be outfitted to match any vision. This lovely couple decorated with florals and fabrics to achieve their springtime vision. After the ceremony, guests didn’t have to travel far. They enjoyed a fun evening of dinner and dancing right at the Rittenhouse! Rebecca and Jared loved celebrating their special day with family and friends. We hope they enjoy their wedding video as much as Allure Films enjoyed filming it! Get the tissues ready – you’ll certainly need them for Diana and Simon’s heartfelt vows! This adoring couple tied the knot at The Rittenhouse Hotel in the heart of Philadelphia’s most prestigious neighborhood. This picturesque venue is breathtaking to begin with, but paired with the beautiful stylings of Lamsback Floral Decorators, it was transformed into a scene right out of a fairytale. We were thrilled when Diana and Simon asked Allure Films to document their big day. It was a pleasure being a part of such a fun and romantic wedding. Family and friends were swept off their feet from beginning to end. Guests had nothing but sweet stories to share about our bride and groom. Click here to contact an Allure Films representative about our wedding videography packages. How perfect is this wedding? Carly and Joe shared a fabulous & fun Philly wedding with the Allure Films team. We enjoyed capturing many candid moments, from the couple’s first reveal to the killer dance moves! Carly and Joe’s big day was filled with unforgettable moments. 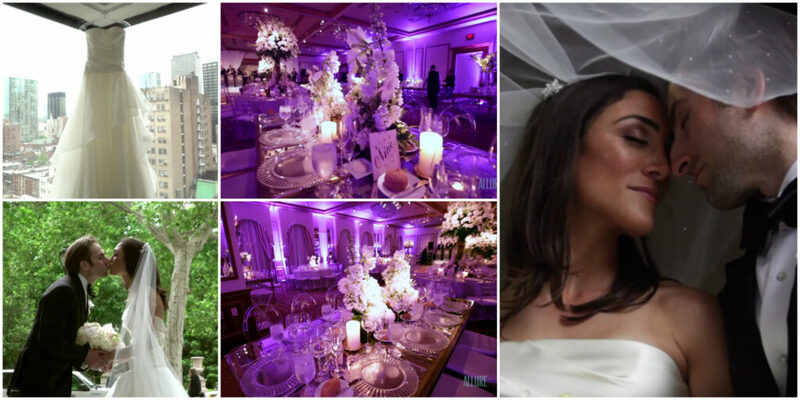 Their wedding festivities took place at The Rittenhouse. Located in the heart of Philadelphia, and surrounded by breathtaking views, The Rittenhouse alone is sure to sweep you off your feet. Now, pair this venue with the amazing stylings of Lamsback Floral Decorators, and you will surely be amazed! From the dazzling decor of the chuppa, to the elegant dining designs, Carly and Joe shared a perfect fairytale wedding. Guests dined and danced late into the evening as they celebrated this wonderful couple. BVT Live’s very own Sid Miller Dance Band kept the dance floor packed, and the party going! What a fabulous celebration! Congratulations to the beautiful couple. Your life as husband and wife sure got off on a perfect foot, and we were honored to have been a part of it! 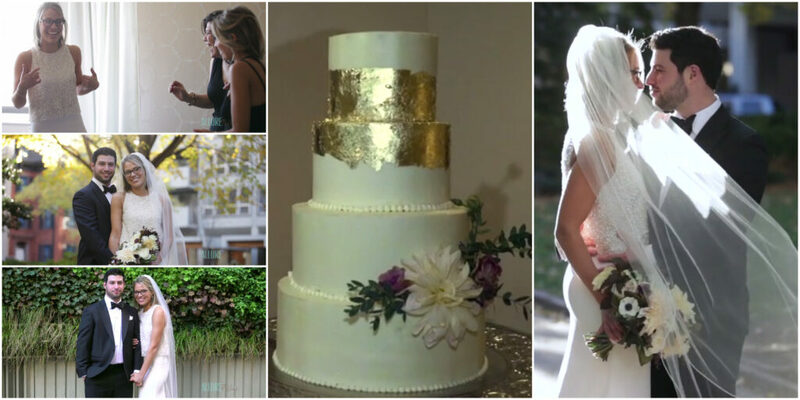 Let’s head to Philadelphia for a preview of Ellen and Greg’s wedding! After exchanging their wedding vows, our bride and groom shared a reception at The Rittenhouse Hotel. Time and time again, we have enjoyed numerous wedding celebrations at this luxurious location. Ellen and Greg’s Rittenhouse wedding is certainly one for the books. Between the candid getting ready moments and the appearances by “historical” guests (wink, wink), this April wedding will be unforgettable. We can’t wait to see the fabulous shots Philip Gabriel Photography took. The dance floor was certainly the place to be, especially because BVT Live! – Midnight Hour was keeping everyone on their feet. A big thank you is in order for this duo. The Allure Films team greatly appreciates being included in your wedding day plans. Congratulations to Ellen and Greg! Planning your own Philadelphia Wedding? Get more information on comprehensive wedding videography packages today! Allure Films was honored to be a part of Kerry and Robert’s wedding celebration. This loving couple exchanged vows among family and friends at the Rittenhouse Hotel. Just when we thought this location couldn’t get any more elegant, Lamsback Floral Decorators stepped in and blew us away (once again). The decor is truly stunning and was the perfect touch for Kerry and Robert’s big day. It was awesome teaming up with Baiada Photography to document all of the loving and fun moments throughout the evening. We were so happy to be part of all the magic. Congratulations to Kerry and Robert and all the best in the future! 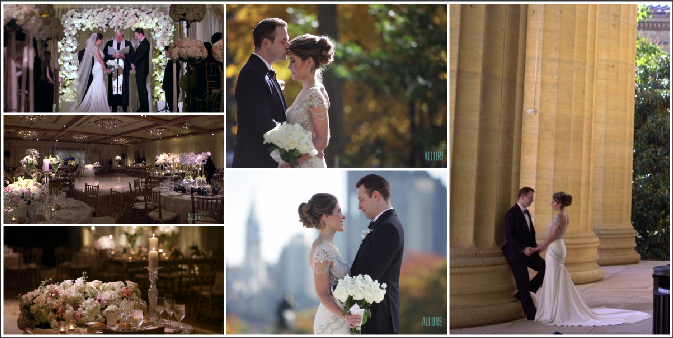 Video One was honored to capture Erica and Carl’s enchanting wedding at The Rittenhouse Hotel. With it’s ravishing setting, and beautiful décor by Evantine Design, Erica and Carl’s wedding was one of a kind. It was a pleasure working with Cliff Mautner Photography in documenting Erica and Carl’s special day. With upbeat tunes from Eddie Bruce Band, the guests couldn’t resist the dance floor! View a short film from this special wedding below. Congratulations to newlyweds Erica and Carl!